Do they know Records Management? I had enough of an answer on each question to enter into a partnership with Nuxeo, but this was all about long-term planning and strategy. I thought I’d share what I learned while letting them learn that there are pros and cons to the publicity that they get by working with me, just ask EMC (who has accepted the balance). Let’s start with the conference. It was unique, and not in a bad way. It was only Nuxeo’s second conference and it wasn’t a large one, though it was 50% bigger than last year. It was held in a theater, the Théâtre des Variétés, in the center of Paris which had the main stage and a small theater tucked into the upper reaches of the theater. 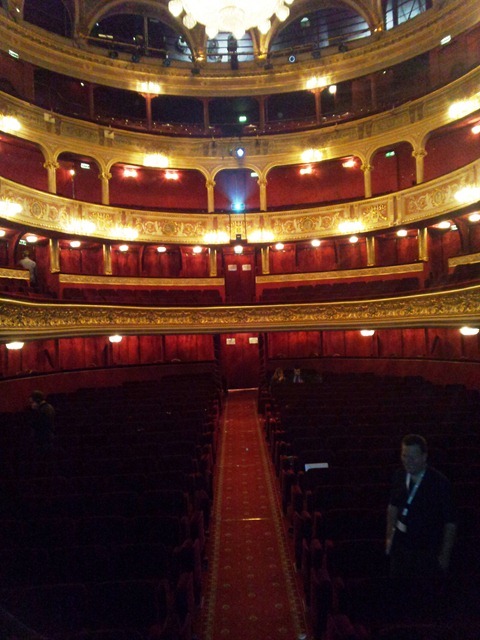 While not friendly for those with bad knees, it was quite interesting to present to an actual theater (nice view!). The downsides were the lack of places to chat privately, everything catered externally, and there were only two rooms for presentations. One theater was more than ample in size and the other was pushing its limits. It is very likely that Nuxeo will out-grow this location next year. Still, it was good. The presenters were all very technically inclined and capable. This led to a large amount of real content and not a collection of marketing slides. The conversations after each presentation could go into as much detail as you could conceive. In general, nice format. Small and technical, but good. It was easy to find whomever you needed to speak with on any topic during the conference. One last detail that I shouldn’t forget, it was preceded by a two-day development sprint. Being an open-source project, anyone can contribute. External developers were invite to join the Nuxeo team to address specific capabilities. They had two days to make as much progress as possible. The award for the best progress was awarded on Thursday night (though I can’t remember what it was that won). I only need one word to sum them up, Smart. Everything else is details. Of course, when you are small, it is much easier to keep the quality. There were diverse backgrounds, visions, and specialties, but they were all smart. Of course, this presents its own problems. While it has led to a great architecture and agile development process, outside perspectives from the broader Content Management arena are not widespread. Nuxeo is a product that feels a little tied to the academics of Content Management with Content Management developer requirements mixed in for good measure. While this isn’t a bad thing, it does make it harder to be proactive in meeting what the market needs. That said, there are some newer faces in Nuxeo that have that broader viewpoint and they are spreading that knowledge. I also contributed a bit with my keynote and threw conversations I had throughout the few days I was in town. Information Governance is one of those areas. The importance of governance to the broad market is something that is obvious to old-school Content Management people, but it is something that is sinking into Nuxeo’s collective consciousness. I think it sank in, but we’ll know for sure in the very near future. The future is bright, assuming they to take on the Records Management and other governance pieces. They are offering Nuxeo in the cloud as a platform, not as an Amazon install. They have an extensive API library and are extremely active in standards. Their architecture is fresh and they seem to be actively working to keep it fresh. There is a lot of opportunity in the Open Source market for another Content Management vendor that has Records Management. There is a lot of opportunity in the market for a company that can offer the same solution either on-premise or in the cloud. There is a lot of opportunity for a Content Management vendor that can successfully deliver a platform. For the vendors that can be among the first to offer all these things, there is a chance to be one of the leaders in the space for the next decade. Nuxeo is heading to this spot. It is the same spot as Box and many of the traditional Content Management vendors. They are approaching the spot from three different directions. Of course, once they get there, the market won’t care how they got there. They’ll just want to buy it. As a veteran of 2 (Or should that be both!) Nuxeo Worlds, I was impressed with the increased interest this year. I find I have come away from the event both years buzzing with the infectious can do intensity of these guys, as you say they are simply smart, and they are so keen to discuss any aspect of the product. For me the real breath of fresh air with Nuxeo is the way they embrace the idea that they can be “part” of a solution, and they are not afraid to share the stage with other open source providers who can provide other parts of the puzzle. My only regret form the conference was that my ridiculously tight schedule prevented us having lunch on Friday!